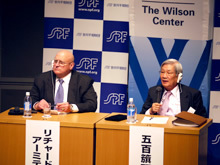 Under our Japan-U.S. Exchange Program, the Sasakawa Peace Foundation has co-hosted since FY2009 the “Japan-U.S. Joint Public Policy Forum” with the Woodrow Wilson Center for International Scholars. Our foundation also regularly holds seminars and conferences to disseminate the results of our own projects and grant projects to a wider audience and to continue our relationship with experts and opinion leaders we have worked with in the past. 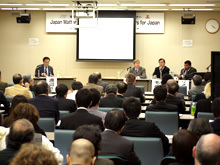 Outreach Seminar Series: "Japan Matters for America/ America Matters for Japan"
In partnership with the Woodrow Wilson Center for International Scholars, the Sasakawa Peace Foundation has hosted an international symposium every year since FY2009 on global security, political or economy issues. 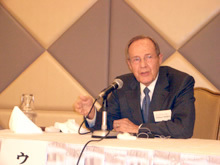 The symposium invites experts from the United States and Japan to discuss how the two countries could cooperate to tackle a global challenge. 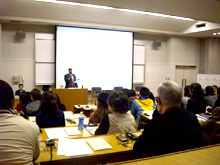 * Mr. Tanaka's presentation is available here. 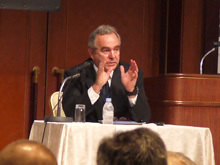 From FY2009-FY2010, with grants from the Sasakawa Peace Foundation, the East-West Center conducted a project entitled, “Japan Matters for America/America Matters for Japan,” which resulted in a website and a printed pamphlet with various data indicating the degree of mutual dependence between Japan and the United States. 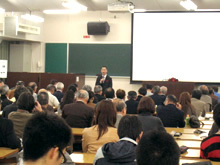 Following the completion of these deliverables, four outreach seminars were conducted in Tokyo, Kyoto , Yokohawa and Nagoya in November 2010 to disseminate the results of the project widely in Japan. 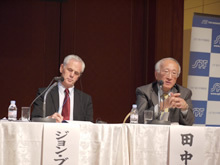 Experts from the United States and Japan served as panelists. 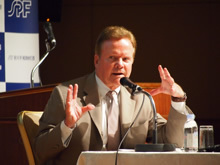 “Japan Matters for America/America Matters for Japan - The US-Japan Past and Future"
※The project tried to strengthen ties between Japan and the US and contribute to mutual understanding through research and dissemination of information from both countries. 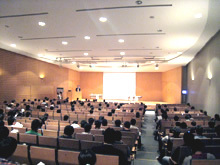 Data in various fields was collected on a state-by-state or congressional district basis for the US, and on a prefectural basis for Japan. 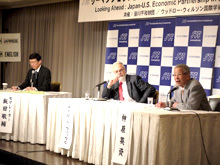 Results has been disseminated on the project’s web site and via Booklet, providing an opportunity to re-evaluate the mutually-dependent relationship that exists between Japan and the United States.